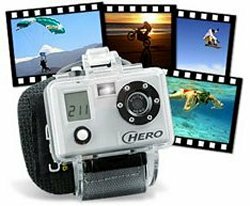 For all those adventurous Richard Branson types of adventurers out there, this is the wrist-worn Digital Hero 3 camera. This thing will stand up to some abuse. It comes in a waterproof and shockproof plastic case that won’t bother your wrist while you wear it all day long. It will snap 3 megapixel still shots and just under an hour’s worth of video with sound. You can even scuba dive with it as it’s waterproof up to depths of 30 meters. It only comes equipped with 16MB of internal memory, but has an SD memory card slot that accepts SD cards up to 2GB in size. It will cost you £99.99. Just go ahead and enjoy your adventurous lifestyle, secure in the knowledge that your rugged wrist camera will survive to snap another picture. This odd-looking camera that looks like a cross between a vintage and modern version captures odd-sized pictures at an incredible 160 Megapixels. Don’t look for this one at your local Best Buy. It’s for specialty photography and the prices for a kit can go as high as $40,000. Notice how the grip ergonomics have been worked out to help keep a firm hold on this expensive beast. It’s MUCH bigger than your average point and shoot, at 6 x 17 inches. One full resolution image taken with this camera at 48-bit colour depth will take up 900 MB of storage space! …At least that’s the impression one gets from the picture of the guy wearing it, on the product site. Apparently the Tie Spy makes you wear dark sunglasses and pretend you are a G-Man. A G-Man with a tacky tie who stands out like…Well, like an overly happy dork with a surveillance device in his tie. They claim that the camera in this tie is the world’s smallest color pinhole camera. But then again they also claim that this tie is fashionable. You can record exactly what you see while wearing it. No external power is needed, since it just connects directly with an included MP4 player. 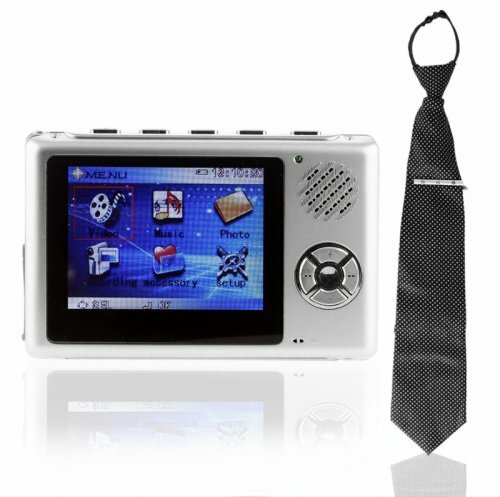 Some of the specs on the MP4 player include: 512MB Memory with the ability to get 1GB using an SD card. 2.5 Inch TFT OLED display, with a resolution of 320×240. Even with the MP4 player thrown in, this tie still probably won’t make you feel like James Bond. Who knows, you might get some dirt on a co-worker, but more likely you’ll just collect videos of your walk to work. From your tie’s point of view of course. Anyone who has ever taken a few pictures knows that lighting is the most important factor. It can mean the difference between a great picture and a catastrophe. Ortery’s Photosimile 5000 is a PC-controlled light box, 360° turntable and a CPS(camera-positioning system) that is compatible with many digital cameras. The Photobox will give you shadow-free pictures for use on websites, presentations, eBay etc. It’s a pretty simple concept. Just you just attach a camera to the light box while your object to be photographed is on the rotating platform, as if you are microwaving it. The light box connects to your PC via a USB cable. The software takes care of all the details, like the camera’s tilt and the speed of the turntable. As long as the item can fit in the box, you’re good to go. 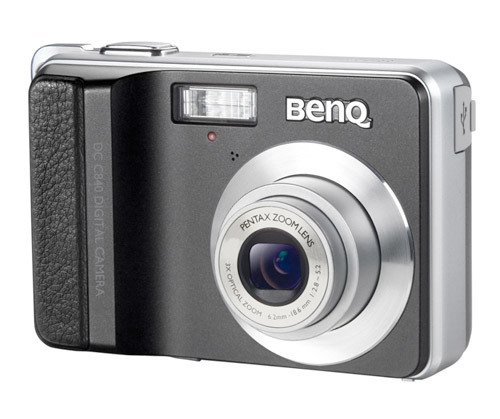 This week BenQ announces an upgraded version of their C740i camera with the C840. The new model features a 2.5 inch LTPS screen with an 8MP resolution and 3X optical zoom. 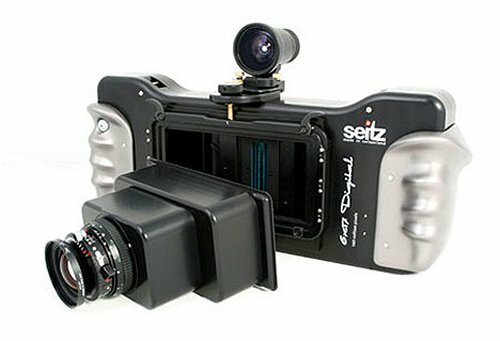 The camera allows for full control over the outcome of the image with its P/Av/Tv/M feature. The C840 is equipped with a Pentax lens facilitating 99.8% light penetration making it the most light sensitive camera in its class. An emphasis on widescreen shooting and an optional 16:9 resolution ratio for HDTV display shows that BenQ is forward thinking with this camera. 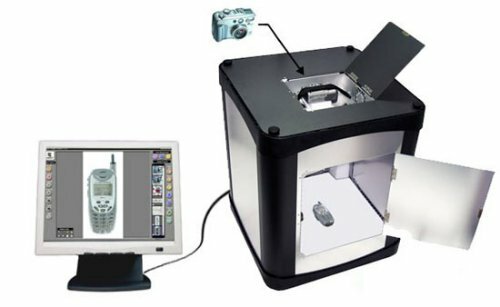 MJPEG videos are shot at a near DVD quality 720×400 resolution at 30 frames per second and are optionally stored in its 4GB internal storage or SDHC card, support for which is an upgrade from the C740i counterpart. 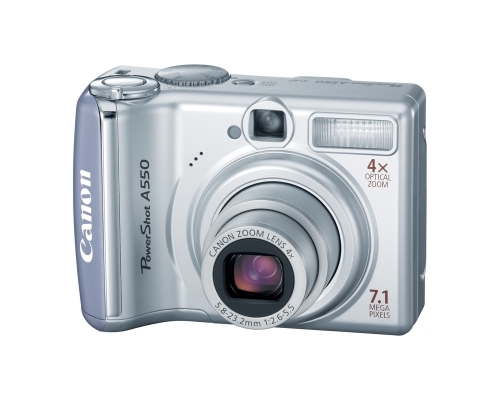 Canon has expanded its line of PowerShot cameras with a new entry level model, the A460. The A460 is meant for the first time camera buyer who still want a decent camera. The A460 has a 5 megapixel resolution and a 4x optical zoom lens and a 2 inch LCD screen. 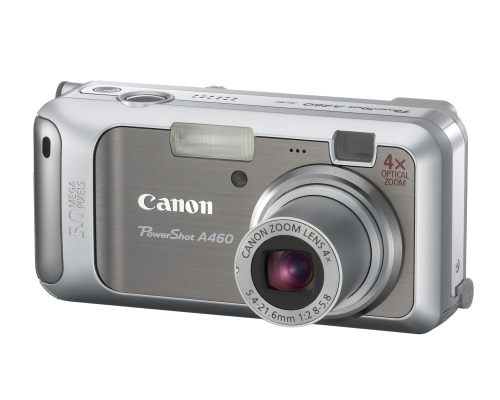 The A460 replaces the Powershot A430 and has a bigger LCD screen and a higher resolution than its predecessor. The A460 is compatible with MMC, SD and SDHC memory. This camera is aimed towards the first time buyer. Canon has expanded its line of PowerShot cameras with a new entry level model, the A550. The A550 is meant for the budget conscious buyer who still want a decent camera. The A550 has a 7.1 megapixel resolution with a 4x optical zoom lens and 2 inch LCD screen. The A550 replaces the A530. The new model has a larger screen, higher resolution and longer battery life than its predecessor. It is compatible with MMC, SD and SDHC memory. It can record 30 (frames per second) VGA video clips. It also has a molded hand grip to make the camera easier to hold.